About 90 tremors were recorded on June 7, and the volcano released an estimated 1,700 tons of sulfur dioxide (20 times more than the amount released last month), said officials. Japan’s weather agency raised the alert level for the volcano to Level 2 [“Do not approach the crater”] last week. Ashfall from the eruption was also reported around the mountain as far as 4 km from the volcano, said officials. Aashfall from a September 2004 eruption covered a large area. 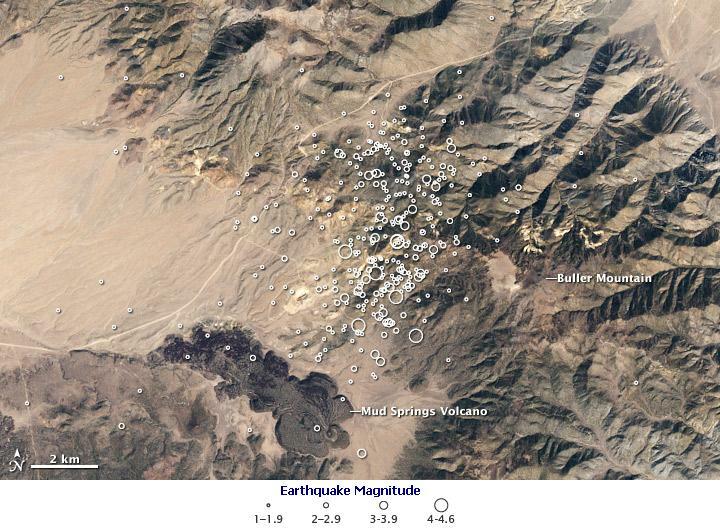 In September, a series of volcanic tremors was followed by a powerful eruption at Mt. Ontake in central Japan, which left at least 57 people dead and 6 others missing. The country’s worst volcanic disaster in 70 years would have been easily prevented had the authorities not failed to heed the warning signs. A powerful eruption ejected an ash cloud to a height of about 9,000 meters in the air, forcing the authorities to evacuate the 140 or so residents from Kuchinoerabujima island on May 29, 2015. 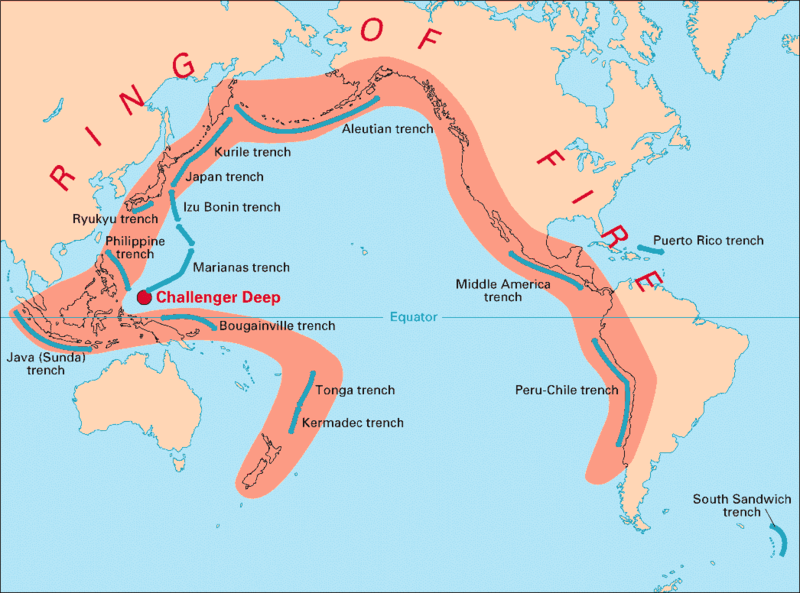 Volcanic eruptions can be far more devastating than atom bombs! For now, deadly Ontake eruption traps more than 270 hikers, injuring dozens and burying 3 others under volcanic ash. 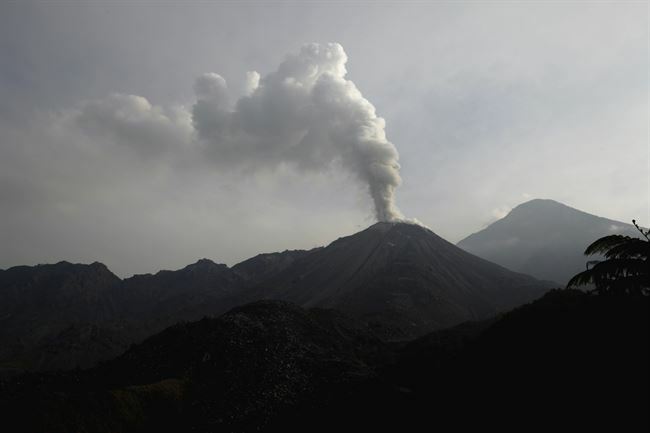 Ontake volcano (283040), the second highest volcano in Japan, which straddles the border between Nagano and Gifu prefectures, erupted late Saturday morning, spewing a thick plume of ash, smoke and volcanic matter up to a height of 3.5km. Pyroclasts including small rocks ejected from the angry volcano have seriously injured at least 32 people, knocking more than a dozen of them unconscious, said local reports quoting officials at Kiso fire department in Nagano Prefecture. Three climbers are missing believed to be buried under volcanic ash. “A 4th person who was buried under ash was later rescued but remains unconscious,” said the local TV news. [Updated at 14:40UTC] At least one person, a 38 year-old female, has been killed as a result of the eruption, said local reports. More than 40 of the 271 hikers initially stranded, taking shelter at a cottage near the volcano summit, still remain on the mountain, including the injured who are waiting to be rescued. The 3,067-meter tall volcano, located about 200km west of Tokyo, last erupted 7 years ago. A previous eruption in 1979 caused significant damage to crops in the nearby farms. “It’s all white outside, looks like it has snowed. There is very bad visibility and we can’t see the top of the mountain,” a worker at a mountain hut for trekkers told Reuters. “There are 15cm of ash on the ground,” she said. 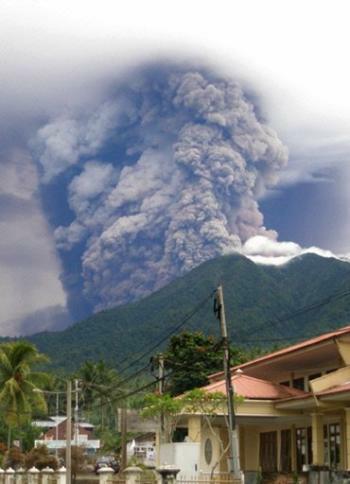 Authorities have warned that the eruption could eject pyroclasts as far as 4km from the caldera. A thick plume of ash was still hanging over the volcano at dusk, TV footage showed. “We expect a lot of injured people so we are now getting ready for their arrival,” said an official at Kiso Prefectural Hospital located near the mountain. Meantime, the local meteorological agency upgraded its 5-stage volcanic alert for Ontake to “Orange” or Level 3—Do not approach the volcano. Meantime, Tokyo Volcanic Ash Advisory issue an eruption alert for SAKURAJIMA-WAKAMIKO (AIRA-CALDERA) 282080, earlier today. The volcano erupted at 10:16UTC (2014/09/27) with the ash cloud climbing to FL070 and extending southwesterly. Thousands of people have been evacuated from around the foot Mt Mayon, Philippines’ most active volcano, as the crater glow became observable indicating presence of molten lava and superheated volcanic gases. MAYON VOLCANO BULLETIN 16 September 2014 8:00 A.M.
Mayon Volcano’s (13.2500°N, 123.6833°E) seismic network recorded thirty-two (32) volcanic earthquakes and seventy-two (72) rock fall events during the past 24-hour observation period. Intensity III (bright) crater glow was visible last night, although rain clouds prevented visual observation of the crater during the day. Rolling incandescent rockfall within the uppermost reaches of the Bonga Gully last night indicates that the summit lava dome is breaching the crater in its southeastern side. 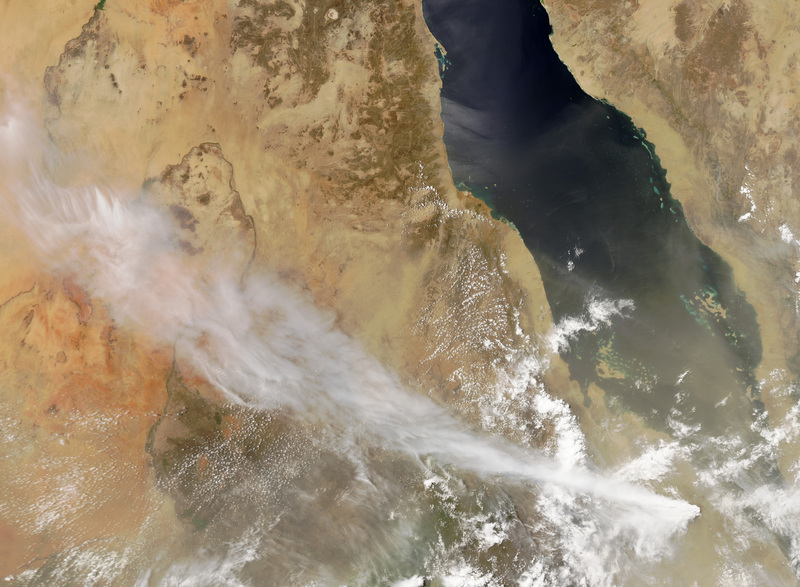 Sulfur dioxide (SO2) flux was measured at an average of 611 tonnes/day on 02 September 2014. Ground deformation data showed inflationary changes in the edifice from February 2014 based on precise leveling surveys on the 3rd week of August 2014, and edifice inflation from January 2012 baselines based on continuous tilt measurement. All the above data indicate that the volcano is exhibiting relatively high unrest due to the movement of potentially eruptible magma. Mayon Volcano’s alert status has been raised to Alert Level 3. This means that magma is at the crater and that hazardous eruption is possible within weeks. It is recommended that the 6-km radius Permanent Danger Zone (PDZ) around the volcano and the 7-km Extended Danger Zone (EDZ) on the southeastern flank be enforced due to the danger of rock falls, landslides and sudden explosions or dome collapse that may generate hazardous volcanic flows. PHIVOLCS maintains close monitoring of Mayon Volcano and any new development will be communicated to all concerned stakeholders. In the past several hours, a noticeable escalation of unrest was recorded by the Mayon Volcano monitoring network. Since 5:00 AM to 8:00 PM today, 39 rockfall events that are ascribed to incipient breaching of the growing summit lava dome across the southeastern crater rim, and 32 low frequency volcanic earthquakes that indicate magma intrusion and/or volcanic gas activity, have been detected. Crater glow has become observable, indicating incandescence of the crater from molten lava and hot volcanic gas. In view thereof, PHIVOLCS-DOST is now raising the alert status of Mayon Volcano from Alert Level 2 to Alert Level 3. This means that Mayon is exhibiting relatively high unrest and that magma is at the crater and that hazardous eruption is possible within weeks. 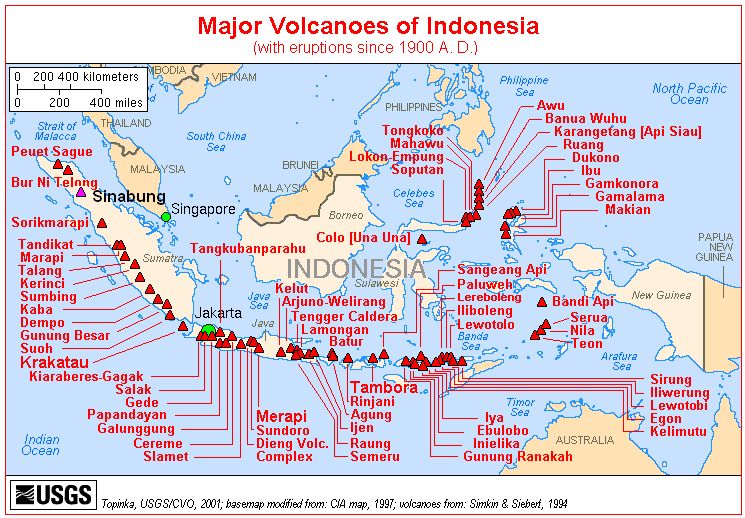 It is therefore recommended that the 6-km radius Permanent Danger Zone (PDZ) around the volcano and the 7-km Extended Danger Zone (EDZ) on the southeastern flank be enforced due to the danger of rockfalls, landslides and sudden explosions or dome collapse that may generate hazardous volcanic flows. PHIVOLCS maintains close monitoring of Mayon Volcano and any new development will be communicated to all concerned stakeholders. Iceland has been rattled by 7 significant quakes measuring between magnitudes 4.6 and 5.3Mw since September 10. 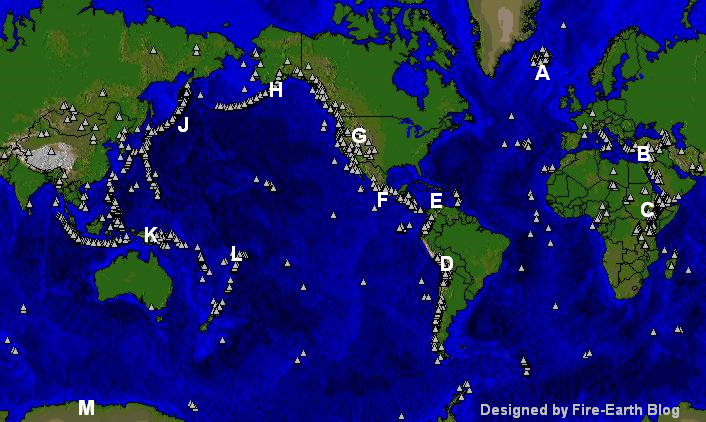 The largest quake measured 5.3Mw, which occurred 108km WNW of Hofn at depth of 10.0 km on 2014-09-15 at 08:05:02 UTC. Sweden registered a rare earthquake measuring 4.7Mw, which struck about 59km (37mi) N of Mora, said USGS/EHP. 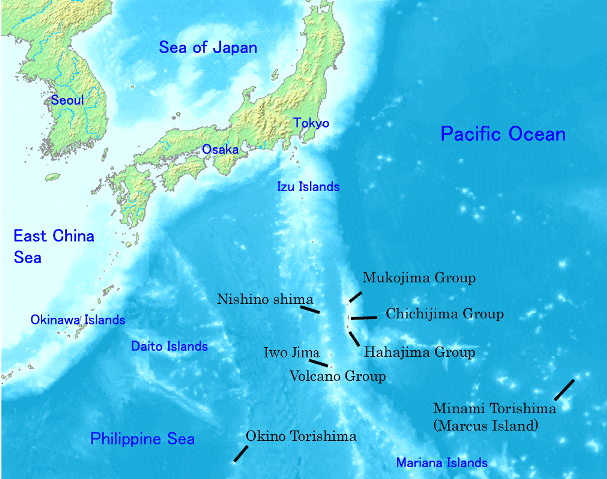 The quake occurred at a depth of about 14.3km (8.9mi), at 13:08UTC on September 15, 2014. Oklahomans were rattled by at least 4 earthquakes over the last 24 hours. The quakes measured between magnitudes 2.7 and 4.0Mw. The largest quake measuring 4.0Mw occurred about 6km S of Guthrie, Oklahoma at a depth of 4.4 km on September 15 at 20:08UTC. Japan recorded a magnitude 5.6 shock striking Ibaraki Prefecture about 44km (27mi) NNE of Tokyo, which scared the living daylight out of millions of local kamikazes. The quake registered 5- (Five Minus) on the local 7-point seismic scale. FIRE-EARTH Science Team has suspended its research on California seismicity to protest Internet censorship, Google’s manipulation of information, theft of FIRE-EARTH intellectual property and other reasons, as previously stated. The Team has suspended its research also on Japan seismicity due to resurgence of militarism in Japan and other reasons, as previously stated. Plumes of smoke, steam and ash from Pavlof continue to reach heights of about 7,500m (24,000 feet), according to Alaska Volcano Observatory (AVO). Meantime, PenAir, a regional airline, canceled flights from Anchorage to Cold Bay and Dutch Harbor on the Aleutian Islands on Wednesday. Pavlof eruption with lava fountaining, early June 3, 2014, as viewed from Cold Bay. Photo credit: AVO/ Robert Stacy. So far, no ash has reached any of local communities, according to AVO. Two strong explosions were recorded in seismic data early this morning (10:05 and 10:45 UTC; 02:05 and 02:45 AKDT) at Pavlof. Lightning was detected by the WWLLN system but there is no indication of higher altitude ash in satellite data. Meteorological cloud tops are up to 29,000 ft. ASL and winds are to the west-southwest. 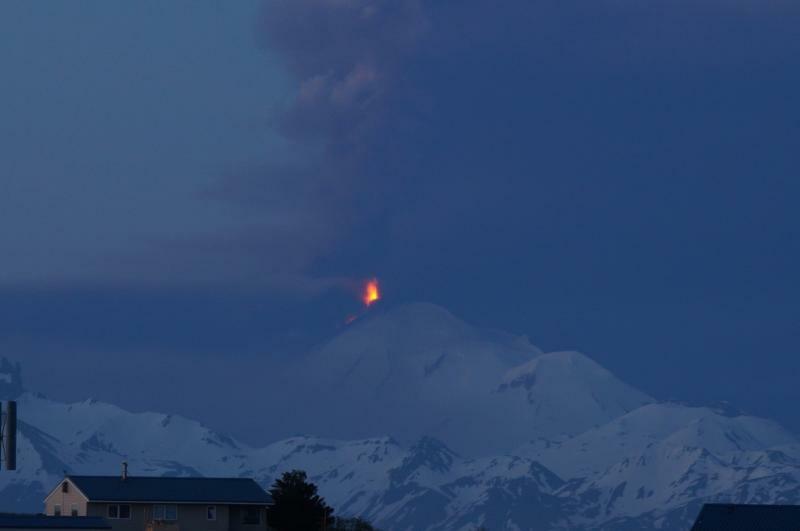 The eruption of Pavlof Volcano continues. Seismicity remains stable and unchanged in the past 24 hours. Persistent elevated surface temperatures were observed in satellite images. FAA web camera views yesterday afternoon showed a towering steam plume above the vent and lower-level ash from pyroclastic flow activity on the north flank. Wind direction has shifted in the past 24 hours to a more westerly direction and recent satellite views show a plume rich in SO2 gas, steam, and minor ash extending variably between 30 and 100 km downwind and passing over Cold Bay. There have been no reports of ash fall in Cold Bay or any other community. Incandescence from lava fountaining was visible in early morning web camera images, however low-level weather clouds obscure more recent views. The magma reservoir beneath Mount St. Helens has been slowly re-pressurizing over the past 6 years, according to the Cascades Volcano Observatory (CVO). The re-pressurization is probably due to the arrival of a small amount of additional magma some 4 to 8 km beneath the surface, said CVO. The re-pressurization in not unexpected because Mount St. Helens is in an active period, as it has been since 1980, said CVO, adding that there was no indication the volcano could erupt anytime soon. The eruption on May 18, 1980, which was heralded by a magnitude 5.2 earthquake, covered an area larger than 600 km² with volcanic matter, destroying entire forests, killing 57 people and causing about $1.2buillion in property damage. Prior to 1980, Mount St. Helens had the shape of a conical, youthful volcano sometimes referred to as the Mount Fuji of America. During the 1980 eruption the upper 400 m (1,300 ft) of the summit was removed by a huge debris avalanche, leaving a 2 x 3.5 km (1.2 x 2.2 mi) horseshoe-shaped crater now partially filled by a lava dome and a glacier. It is primarily an explosive dacite volcano with a complex magmatic system. 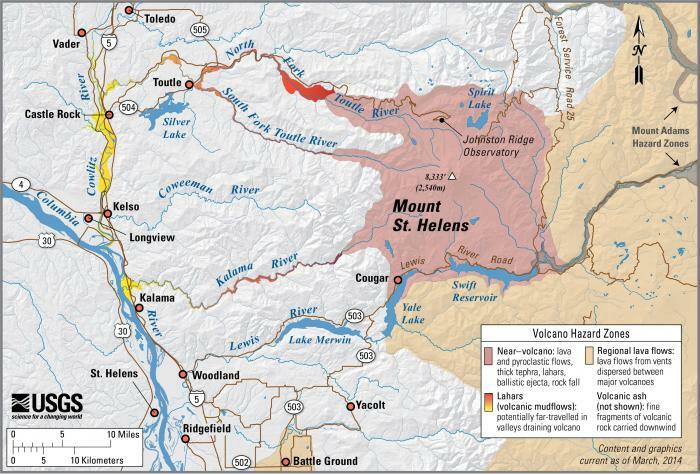 Mount St. Helens, Washington simplified hazards map showing potential impact area for ground-based hazards during a volcanic event. Tungurahua erupted on Friday, ejecting a massive plume of smoke and ash 10km into the air during a 5-minute episode. 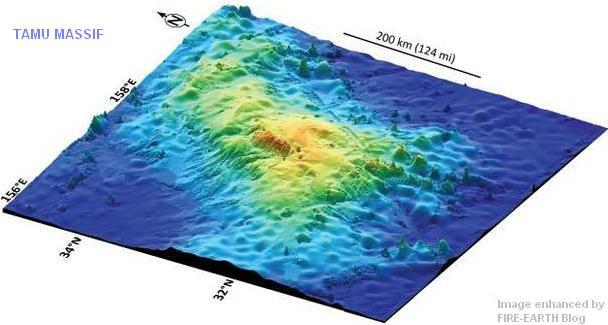 The 5,023-m volcano has been active since 1999, and has shown signs of increased activity since February 1, 2014. “Throat of Fire,” as it’s known in the in the local Quechua language, is one of nine or so active volcanoes in Ecuador, located about 140 km south of the capital, Quito. Baños de Agua Santa, or Baños, as it is commonly referred to, is located in central Ecuador on the northern foothills of the Tungurahua volcano. It is the second most populous city in Tungurahua Province with a population of about 10,000. Freeze frame from a local news video clip showing Friday’s eruption. Some 2,500 people living near Shinmoedake volcano on Japan’s Kyushu island were advised earlier today to evacuate their homes after heavy rain threatened lahar avalanches, reports say. Mount St. Helens and Spirit Lake, as seen from Bear Cove. Image Source: U.S. Forest Service via USGS/CVO.